Some newer vehicles roll right off the factory line with remote car starter functionality, and the benefits of this feature are easy to work out. By warming up the engine before you ever get in the car, you ensure that the oxygen sensor is all heated up and the emission controls are working at peak efficiency from the moment you back out of your driveway. And aside from that, you can also slide into an already warm passenger compartment on cold winter mornings, and enjoy a burst of cold air before setting out on a long summer commute through stop-and-go traffic. While OEM remote car starters are relatively new, these devices have been available through the aftermarket for a long time. Often paired with car alarms, keyless entry systems, and other similar devices, they are also available as standalone units. How Much Do Remote Car Starters Cost? When you buy a new car that comes with a remote starter, the cost is usually buried somewhere in the fine print. Compared to the cost of everything else, it usually isn't that big a deal. Aftermarket remote car starters aren't that expensive, relatively speaking, but there are two associated costs to take into account: the price of the remote start kit and the cost of installation. While it's possible to find a basic remote starter online for under $100, that's just the install kit. And the fact is that installing a remote car starter can be a pretty complicated job, especially if your car has built-in anti-theft measures. Reputable installers typically charge in the neighborhood of $400 for a remote starter and the labor to install it. Cheaper options are often available, especially if you can find a deal through a site like Groupon, but research what you're getting. For example, what looks at first like an especially good deal may only include a very basic remote starter, and adding any advanced options may result in a much more expensive final bill. Remote car starters are devices that allow a vehicle to be started without requiring either the driver or the key to be physically present. This feat is accomplished through a component that is connected to the ignition system and fitted with a radio receiver. When that component receives a signal from a paired transmitter, which typically takes the form of a key fob, it activates the starter motor. Since a remote car starter just simulates the same action that takes place when you turn the ignition key, these systems have a few limitations. One is that they typically don’t work very well with carbureted vehicles. Special carburetor kits are available for some remote starters, but these kits usually won’t do the trick for particularly temperamental vehicles that require a lot of fiddling with the gas or choke. If a vehicle requires manual intervention, such as a tap of the gas pedal to drop off high idle, remote starters are especially problematic. 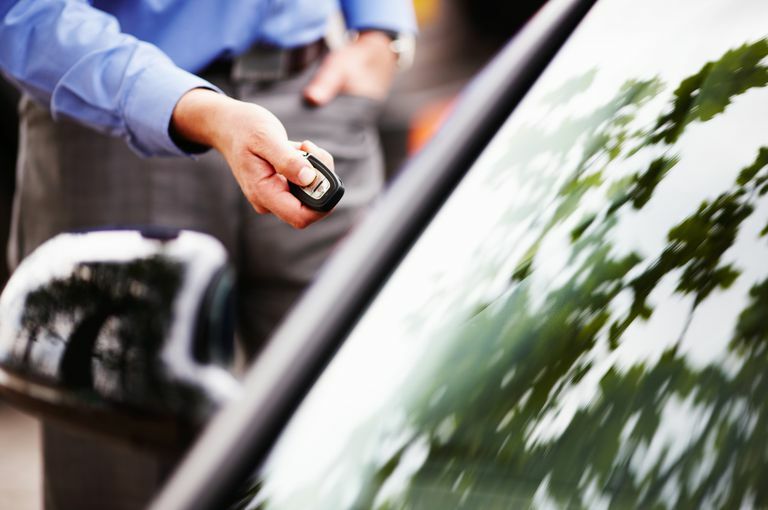 Newer vehicles that ship from the factory with built-in anti-theft measures typically require some type of bypass component in order for the remote starter to work without a key in the ignition. See more about choosing a remote start kit. Basic remote car starters use a simple transmitter/receiver setup, which lets you start your vehicle with the press of a button. In systems that use two-way remotes, the remote control can both send and receive information. That feature allows the remote to display information like the interior temperature of the vehicle, which can be invaluable if you’re waiting to go out until it warms up or cools down to a comfortable level. Since a remote car starter has to be hooked into an ignition system to work, some of these devices also have the ability to shut the ignition system down. If the starter disconnect feature is activated, it will typically prevent the vehicle from being hotwired. Some remote car starters also have even more advanced features that can be activated if a vehicle is stolen or carjacked, which typically sets the alarm off and then disconnects the starter after the vehicle is shut off. Remote car starters typically come with one or more remote controls that are designed to also act as key fobs, but some of these systems can also be operated using a smartphone app. These systems are often two-way as well, which allows the smartphone to display a variety of information transmitted by the remote starter system. Some car security systems have built-in remote starters, and some remote starters include auxiliary outputs that allow alarms and other devices to be hooked up later on. While it isn’t always necessary to pay for a professional installation, some remote car starter installations are more complicated than others. Newer vehicles that require anti-theft system bypasses, for instance, require more wiring, and older carbureted vehicles typically require additional hardware. There are also special considerations when installing a remote starter in a car with a manual transmission. If you do want to save some money with a DIY installation, it’s vital to get your hands on the right wiring diagrams before you start, since guesswork may leave you with a costly repair bill.